Our first kicking camp of the 2014 season kicked off this past Sunday afternoon in Dallas, TX. 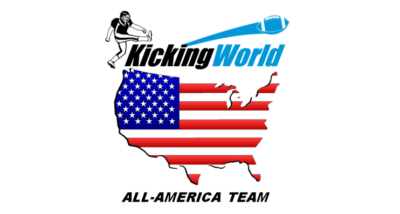 Four campers earned a spot on the Kicking World Hot Prospect List. Our first kicking camp of the 2014 season kicked off this past Sunday afternoon in Dallas, TX. We were greeted with unseasonably warm weather all weekend! There were lots of big hitters and four (the most ever from a camp) students were added to the Kicking World Hot Prospect List from this camp! We had 19 participants over the 5 hour 1-Day kicking camp and it was a major success. Students from all over Texas, as well as Oklahoma, Louisiana and Missouri attended our first Texas kicking camp of the 2014 season. We posted over 500 photos from the camp weekend on our Facebook Page as well as cool video clips from the competitions on our Instagram page. All 4 Hot Prospects will get their own unique Profile page on the Hot Prospect List where they can showcase their highlight videos, camp stats, coach’s comments, game stats and more. There were several outstanding performances and top kickers and punters this weekend and as always we were not surprised by the superior talent in the great football state of Texas! We look forward to seeing ya’ll in Austin on March 22 and/or Dallas again on April 26-27.